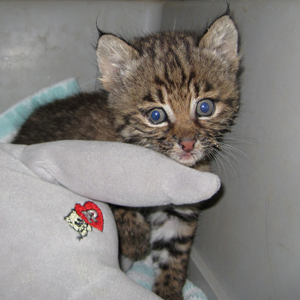 Yemaya’s journey to Southwest Wildlife began when some workmen heard a kitten crying. They investigated and found a tiny bobcat. She was taken into the office where they tried to feed her cat food and give her water. Still at an age where she would be nursing, she didn’t know what to do with the offerings. They played with her throughout the day and tried to comfort her, but she squalled and complained. She was dehydrating. She reached out continuously for anything that she might be able to nurse. They finally decided she needed more help than they could give her, did a little research, and contacted Southwest Wildlife. Yemaya was very small when she arrived at SWCC. We can never know exactly how Yemaya ended up alone. What we do know is that her interaction with people during a critical period in her development affected her profoundly. She imprinted on people. When an animal imprints they identify what is “normal” for them. They bond to and will follow whatever or whomever they imprint upon – usually their mother. For Yemaya, normal was people and dogs. She was nursed back to health with baby formula made especially for bobcats and appropriate foods to eat. As she grew she became more and more bonded to her caregivers. She’s one of the most un-bobcat-like bobcats at the sanctuary. 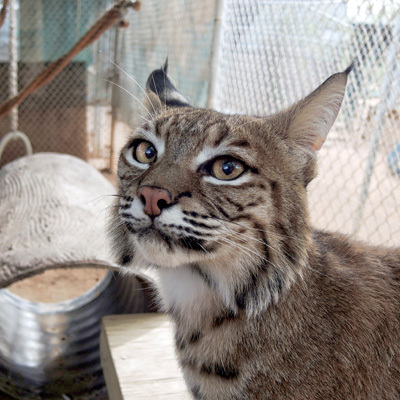 Could she have been released, a wild bobcat, if people hadn’t handled her? Possibly. She’ll never have that chance. Please share Yemaya’s story and encourage people to act responsibly with wildlife. Leave them in the wild or get them to someone especially trained to care for them, like a licensed wildlife rehabilitator. 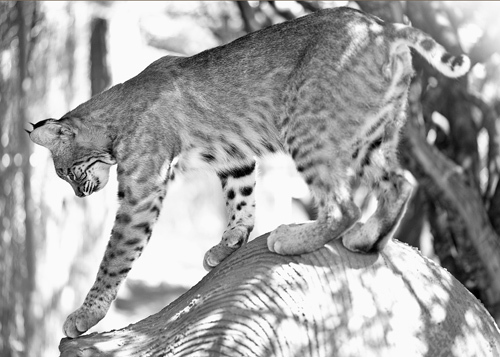 Yemaya won’t ever be a wild bobcat, but she will have a home at our sanctuary for life.